A List Of Pros and Cons You Must Know Before Making Malaysia Your Study Destination! Studying in Malaysia can be a life-changing decision. No matter if you are a native student or enrolled on as a foreigner student, you can get many perks of studying in Malaysia. This country offers plenty of benefits for students from any part of the world. Malaysia has some of the best universities around the world. Some of them are even affiliated with one of the world’s most prestigious institutions and offer courses in many valuable degree subjects. As an individual, you can have your preferences while choosing Malaysia as your study destination. Every student prefers studying in a country that has the best quality of life. Malaysia is one of most progressive countries in Asia with the best amenities. From clean environment and hygienic foods to modern infrastructure and strict laws, Malaysia is a heaven for any student coming from any part of the world. The very name of Malaysia conjures up visions of natural green scenery, flowers, and splashes of bright colors. Sadly, the greenery is fast being taken over by the increasing concrete jungle. Still, there are several sightseeing places in Malaysia, such as Langkawi, Genting, and Malacca. This makes Malaysia comparatively one of the most popular study destinations. The beautiful scenery, tranquility, and warm temperatures are some of the prominent features of this beautiful land. So if you choose Malaysia as your study destination, you are likely to enjoy the best climate. 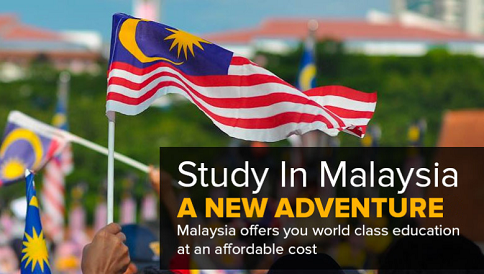 Malaysia is a more economical study destination for North American and European countries. On an average, the Americans would probably find the cost of living and tuition in Malaysia significantly below the living expenses in America. When it comes to education, Malaysia also has an affordable fee structure as compared to any other institutions in European and American regions. Malaysia is a country that knows its fair share of English. Thus, many students from around the world can easily adjust in Malaysia. However, the English skills cannot be expected to be perfect as English is at best a second language for most Malaysian. The education ministry of Malaysia regulates the British curriculum at every tier of education. The country has some of the most eminent scholars who hold Gold Medal in different subjects. In fact, it is an integral part of the policy of ministry of education to attract the students from around the world. In addition, the government also offers subsidies for international students and provides them internship opportunities in many of its organizations. Those studying in Malaysia seem to prefer staying within their ethnic community. So the foreigners would obviously feel like a misfit among others since most of the students are still Malaysian, while the other ethnic groups tend to stay closer to their ethnic group. Of course, this depends on the overall culture of each individual’s university as well as the policies and practices it follows. If you are enrolled in a culturally diversified institution, you are not likely to face any such scenarios. Many students who are studying or have studied in Malaysia claim that Malaysian lecturers are generally not up to the mark. This fact is primarily associated with their weak English language skills, poor time management, and a combination of other factors. It doesn’t necessarily have to do with the qualifications, experience, or the teaching style of the lecturer himself. Those with experience have also reported that just like any other educational institution, some Malaysian lecturers are gentle, cooperative and caring towards students, while others are extremely strict and despotic. However, this attribute is not typical of a particular country. There is a possibility that some colleges inherently have a racist faculty. Therefore, it’s always best to take opinions from those who are in the inner circles of the faculty. You can also read online reviews of any specific institution for more accurate judgment of the organization. After graduation, a student usually looks for a job. However, those on a student visa are not allowed to stay and they have to file a work permit application for employment in Malaysia. But there are very few job vacancies for the foreigners. However, those with the required capabilities and qualifications are always welcome to try! Studying in Malaysia can be a lot of fun and memorable experience. However, one would have to look at the social, economic, and even personal factors to make the right decision. Of course, it takes time to take such an important decision of life. So, you can take expert opinion of a veteran for validation.